Royale feat. Blasterjaxx – This Thursday! 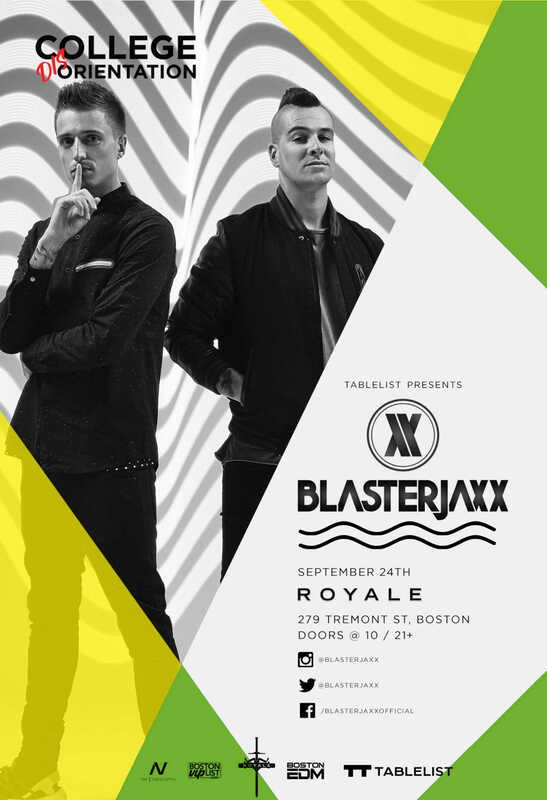 Get ready for a College Disorientation throwdown with Blasterjaxx this Thursday night at Royale. We have $15 tickets, and some great table packages! See you there! Thom Jongkind and Idir Makhlaf, the two DJs that form Blasterjaxx hail from the Netherlands. Their awesome sound falls under the categories of big room house, electro house and Dirty Dutch. These two young DJs couldn’t be more different – one is vivacious and outgoing, whilst the other prefers to remain in the background, yet when they come together, their music emanates the passion, love and dedication they have for their art. After many successes, including having Tiesto personally approach them about signing their production ‘Loud & Proud’, Blasterjaxx are quickly rising as the most prominent EDM artists in the world. Book your ticket and enjoy entry to the event! IMPORTANT: Ticket does NOT let you skip the line. Credit DOES NOT apply to tickets. Click below to book your ticket. We’ll see you there!